The heroics of black Union soldiers in the Civil War have been justly celebrated, but their postwar lives largely neglected. Donald Shaffer's illuminating study shines a bright light on this previously obscure part of African American history, revealing for the first time black veterans' valiant but often frustrating efforts to secure true autonomy and equality as civilians. After the Glory shows how black veterans' experiences as soldiers provided them for the first time with a sense of manliness that shaped not only their own lives but also their contributions to the African American community. Shaffer makes clear, however, that their postwar pursuit of citizenship and a dignified manhood was never very easy for black veterans, their triumphs frequently neither complete nor lasting. 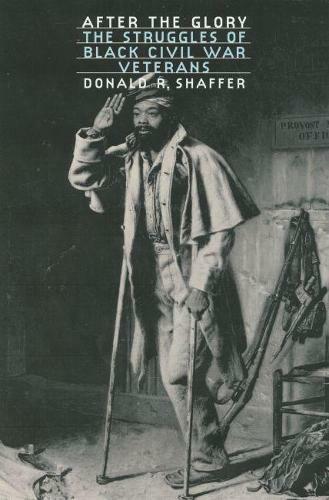 Shaffer chronicles the postwar transition of black veterans from the Union army, as well as their subsequent life patterns, political involvement, family and marital life, experiences with social welfare, comradeship with other veterans, and memories of the war itself. He draws on such sources as Civil War pension records to fashion a collective biography.